Best practice, consistent, and efficient construction cost estimating should consider Owner, Builder, and AE requirements. Here’s a shortlist for your consideration and comment. 1. EXPERIENCE, EXPERIENCE, EXPERIENCE. Nothing is more important than decades of actual experience in the field as well as detailed line item experience. 2. COMMUNICATION – Use industry standard terms in plain English for each construction task. Minimize the use of acronyms and/or abbreviations. In fact only use abbreviations for units of measure. 3. Common data format (CDE) – Use CSI MasterFormt (50 division) to organize data. 4. Detail – Assure labor, material, and equipment breakdowns are available for EACH task as appropriate. 5. Integrate your work with a LOCALLY RESEARCHED unit price commercial construction cost data base. You can’t know or keep up to date on everything, and even if you did/could, this is a great way to supplement your data. DO NOT USE a national unit cost book and/or location factors/indexes. The latter will introduce significant error. The ability to accurately communicate detailed cost data and associated tasks from concept through construction, repair, maintenance, and renovation is critical to efficient life-cycle management for the built environment. Despite this fundamental fact, construction cost data is rarely communicated in a standardized format that is easily understood by all parties… architects, engineers, contractors, owners, and building users. The simple truth is that without detailed line time descriptions of construction task and requirements, communicate in plain English, is it impossible to collaboratively communicate and fully understand budget needs. Efficient life-cycle management of facilities and other physical infrastructure is impossible until real property owners are better educated and truly capable in their role as stewards of the built environment. LEAN best management practices and associated collaborative construction delivery methods (Integrated project delivery – IPD, Job Order Contracting – JOC, etc.) are REQUIRED in order to deliver quality renovation, repair, sustainability, and new construction projects on-time and on-budget. Most Owners do not have the educational background or professional experience needed to consistently deploy LEAN construction delivery methods and/or life-cycle management. One thing is clear, the construction sector (architecture, engineering, contractors, owners, operators, users, suppliers) has been lagging virtually all other business sectors for decades with respect to productivity improvement. I believe that the cause is largely cultural, however, any major improvement must be driven by Owners,and/or mandated by governmental regulation. My reasoning is simple, Owners pay the bills. Thus as long as Owners remain satisfied with the status quo and/or remain “uneducated” with respect to proven business “best practices” and lean management processes, as well as supporting technologies, economic and environmental waste will continue to be rampant. Currently, my outlook is somewhat pessimistic. If one looks at capability and knowledge specific to life-cycle facility management from an industry perspective, most has originated with the government sector, followed by higher education, state government, healthcare, process-based industries, etc. etc. Basically, Owners whose mission is dependent upon their built environment tend to create and follow life-cycle management practices. These are Owners that can’t adopt a “churn and burn”, or “run to failure” approach to facility management. These sectors can’t easily pack up and move if their facilities and physical infrastructure fail. That said, even government owners, for the most part, have failed in any sort of department or agency-wide adoption of standardized best practices. This is true even for “simple” areas such as facility repair, maintenance, and renovation. Only the Air Force appears to come close to having any true adoption of robust, proven, best-practices in this regard, as well as associated training, etc., most notably with their SABER construction delivery structure. In order to effect measurable productivity improvement in the “construction” sector, , I have put together a core requirements “checklist”. 1. Robust Ontology – Cost effective information management and information reuse can only be accomplished with a detailed set of terms, definitions, metrics, etc. This aspect is also critical to improved strategic and tactical decision support mechanisms. 2. An understanding of life-cycle management of the built environment from a collaborative, best-practices, process perspective as well as associated supporting technologies. Forget the traditional strategy-design-construction-demolish approach. 3. Commitment to a total cost of ownership perspective including both economic and environmental costs vs. our classic “first-cost” mentality. 4. “Trust but measure” – Owners MUST conduct their own internal cost estimating and associated capital planning and compare these to contractor estimates, with each party using the same data architecture (examples: RSMeans, masterformat, uniformat, omniclass). 5. Adoption of collaborative construction delivery methods such as Integrated Project Delivery, IPD, and Job Order Contracting, JOC, in lieu of antagonistic and inefficient design-bid-built, or even design-build. 6. STOP reinventing the wheel. Nothing noted here is “rocket science”. Many, if not most, processes, procedures, and technologies are readily available for anyone who does a bit of basic research!!! Also, stop with the focus upon BIM from a 3D visualization perspective! 3D tools are great, and add value, however, INFORMATION and PROCESS drive success. The Value of NBIMS = The Value of BIM? The primary focus of the NBIMS-US™ is to provide open standards to transform the currently inefficient and ineffective life-cycle management of the built environment… Is this not the same value provided by BIM? This transformation is accomplished through the creation and exchange of building information modeling (BIM) information and management processes. Elements included include reference standards; outlining classifications of data and processes, data exchange formats, requirements for many different types of information exchanges and practice standards; which outline practices and workflows for data modeling, project execution, and robust feedback on success or failures so that assumptions are quickly improved. The metrics by which these open standards are to be evaluated include: total cost of ownership vs. first costs, impacts upon organizational mission, sustainability, life-safety, utilization, up-time, project timelines, fewer change orders, fewer legal disputes, …. Reduce the total cost of ownership of the built environment in concert with the mission of an organization and its relationship to the environment via timely, accurate, re-usable information and associated enhanced decision support capability. Enable collaboration and information sharing among all shareholders via established products, methods, and information formats. Front end information gathering, planning, and decision-making to have the greatest positive impact in the overall design, procurement, construction, operations, and decommissioning process, taking advantage of collaborative, integrated project delivery. How can I better optimizing building performance to contribute to improving overall performance (e.g. financial, environmental, organizational, operational efficiencies) across the lifespan of my physical assets. Where can I find process documentation and contract language to cost-effectively develop and consistently deploy efficient construction delivery methods, enable high quality and quantity work at a reasonable cost. How to perform more projects that provide a more predictable revenue stream and a reasonable profit margin. Participation in emerging efficient project delivery processes to better acheive design excellence, meeting project schedules and exceeding client service expectations. 2. How to mitigate risk. 3. How to organize my organization and project teams to take advantage of BIM processes and technologies. 4. How to participate in emerging efficient project delivery processes to focus on design excellence, meeting project schedules and exceeding client service expectations. The National BIM Standard is a consensus document, where many ideas are brought together, presented to a variety of people representing different parts of the industry, discussed, debated, and ultimately subjected to the democratic process to determine which ideas rise to the stature of inclusion. BIM Objects, Data, and Information – More than a 3D Pretty Picture – Soooo Much More! BIM objects are much more than just graphical representations. Using them as placeholder to connect to a wider source of information provides for a powerful and rich source of information. Information in the Building Information Model (BIM) comes from a variety of sources, such as 3D visualization tools ( Autodesk Revit or Nemetschek Vectorworks, Archicad, Bentley Systems …) as well as cost estimating, computerized maintenance management systems (CMMS), capital planning and management systems (CPMS), geographical information systems (GIS), building automation systems (GIS), model checkers and specification software. All BIM objects have properties, and most also have geometries (although some do not, for example a paint finish). To avoid duplication, information should be both structured and coordinated. Some information is more appropriately located in the ‘geometrical’ part of the BIM object while other information is more suited to the ‘properties’ part, such as the specification. The specification is part of the project BIM, and objects live in the specification. In traditional documentation we would ‘say it once, and in the right place’, however with BIM, we want to ‘author it once, and in the right place, to be able to report it many times’. Let’s take an analogy of a BIM object representing a simple cavity wall. The object will tell us the width of the brickwork and height of the wall. However at a certain point in the project cycle it is the written word that is needed to take us to a deeper level of information. It is within a textual context that we describe the length, height and depth of the brick. It is words that are used to describe the mortar joint and wall ties. BIM objects are as much about the embedded data and information as they are about the spaces and dimensions that they represent graphically. It is this connection to a wider source of information that really empowers the object, making it a rich source of information. Think of BIM objects if you will as a ‘place holder’ – not only a physical representation of the real life physical properties of the said object but also a home for non-graphical information such as performance criteria, physical and functional condition data, life-cycle data, detailed and current cost data (materials, equipment, and labor), and operational information. Specifications were once undertaken by the specification expert, often once the detail design was completed. A new generation of specifiers is being empowered by BIM. We can begin to specify at a much earlier stage in the process. In reality “specifiers” are now a team of stakeholders – Owners, Contactors, Subs, AE’s, Oversight Groups …. By connecting the BIM object to an NBS Create specification, a direct link can be made to NBS technical guidance and standards, at the point where the designer most needs them. For example, if the designer is a subscriber to the Construction Information Service (CIS), then any technical documents cited in the specification that are available can be downloaded instantly. BIM and BIM workflows are consistently being refined and updated as they become more commonplace and as standards and protocols emerge. While we can never solve all coordination issues, we hope to improve coordination by linking databases, objects and eventually coordinate key property sets. Traditionally, a value that was represented on a drawing may not correctly corresponded with the value within the specification simply due to a ‘typo’. An example being where a ’60 minute fire door’ has been recorded on the drawing but has been recorded as ’90 minutes fire rating’ within the specification. Aside from this coordination debate, practices will also need to decide and establish office policies on where information is recorded. While the specification system has detailed guidance and links to standards, regulations and suggested values, geometric BIM software has great visualization analysis and instance scheduling functionality. At present, the NBS National BIM Library objects are classified using both the draft Uniclass 2 Work result code and the System name to give a deeper link between the object and specification. The NBS National BIM Library contains a number of objects that connect at a ‘product’ level (e.g. hand driers, baths, individual doorsets) while others work at a ‘system’ level (e.g. cubicle, partition, door and signage systems). Yet other objects are at an ‘element’ level (i.e. made up of a number of systems) such as external walls. Following a period of industry consultation, Uniclass 2 is now being finalized for publication during 2013. Classification of content in the National BIM Library and NBS Create will then be updated. A hand drier is an example of an object that links nicely to an associated product clause (NBSReference=45-35-72/334). Using tools such as NBS Create and the NBS Revit plug in tool, the corresponding product will automatically be captured; it can then be used to enrich the object with information such as power rating and noise levels. A doorset is an example of an object that maps beautifully to an NBS Create System outline clause. For example using WR 25-50-20/120 Doorset System, we can then specify system performance, component and accessory products (e.g. glazing type, fasteners and threshold strips) as well as execution. Certain NBS National BIM Library objects are at an ‘element level’ where they comprise a number of systems. In this situation we give a primary work results classification, the NBSReference. In addition, to help the user, we add the Uniclass 2 element code in an extra parameter field. The following example is a Unit wall element comprising 100 mm thick stone, 100 mm mineral wool insulation batts and 100 mm concrete block, lined with 12.5 mm gypsum plasterboard on 25 mm dabs. WR 25-10-55/123 ‘External multiple leaf wall above damp proof course masonry system’ has been used for the primary reference. From this System outline we can specify the stone facing, insulation and concrete block, together with DPC, lintels, mortar, cavity closers (which all in turn have product codes). A further system outline, WR 25-85-45/140 Gypsum board wall lining system, is given, from which the lining can be specified. An object could potentially relate to two different systems. An example of this would be a rainscreen cladding object. The following example is an aluminium cassette panel rainscreen system with metal frame, weather barrier, insulation, concrete block and plasterboard lining. This particular system could be either a ‘Drained and back ventilated rain screen cladding system’ 25-80-70/120 or a ‘Pressure equalized rain screen cladding system’ 25-80-70/160. The detail which would differentiate between the two is not shown in the geometric object itself but rather in the detail that would be found within the specification. When used in conjunction with the NBS plug-in tool, you are presented with the option to select the most appropriate system, and then to specify it to the appropriate level of detail. We are now beginning to see project information being coordinated through intelligent objects. The classification system, structure of data and technology are enabling better processes and will allow us to move a step closer towards full collaborative BIM. via www.4Clicks.com – Leading cost estimating and efficient project delivery software solutions for JOC, SABER, IDIQ, MATOC, SATOC, MACC, POCA, BOA, BOS … featuring and exclusively enhanced 400,000 line item RSMeans Cost Database, visual estimating / automatic quantity take off ( QTO), contract, project, and document management, all in one application. BIM is NOT 3D Visualization – 4D, 5D …..
Building Information Modeling, BIM, is the life-cycle management of the built environment supported by digital technology. As such, the core requirements of BIM include collaboration, standardized information, multiple domain competencies, and several supporting interoperable technologies. 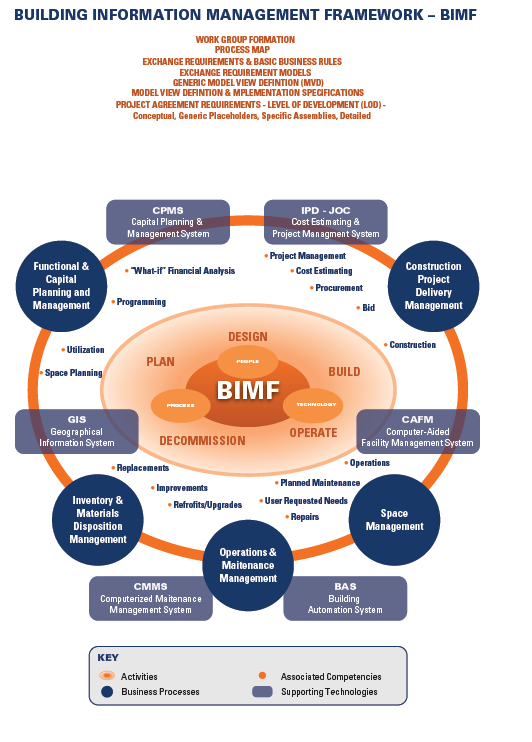 Let’s face it, BIM continues to languish. Sure a lot of architects use it for pretty pictures to win business, and there are several “case studies” surrounding clash detection, etc. etc. 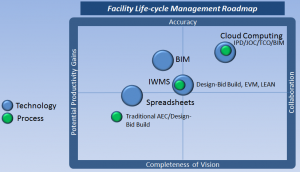 However, life-cycle and/or ongoing facility management using BIM? No so much. This is not only sad but economically and environmentally imprudent. The efficient life-cycle management of the built environment is critical to both global competitiveness and preserving sustainable resources. Why is BIM of to a slow start? Too much focus on 3D visualization, too much “reinventing the wheel” trying to fit a square peg in a round hole, and virtually NO EMPHASIS upon the requirements for life-cycle management… associated competencies, domains, technologies, ongoing collaboration, integration, and continuous improvement. Design-bid-build and “low bid” awards are the downfall of the Architecture, Engineering, Construction, Owner, and Operations sector. The method is antagonistic, wasteful, and typically delivers poor initial and ongoing results. Focus upon CHANGE MANAGEMENT and building awareness relative to both COLLABORATIVE CONSTRUCTION DELIVERY METHODS AND LIFECYCLE, TOTAL COST OF OWNERSHIP MANAGMENT is the only thing that will “kick start” BIM. Integrated Project Delivery (IPD) and Job Order Contracting (JOC) are both collaborative construction delivery methods that have been proven for decades, however, awareness remains low. IPD’s focus is upon major new construction, while JOC focuses upon the numerous renovation, repair, sustainability, and minor new construction projects so critical to efficient use of our current infrastructure. 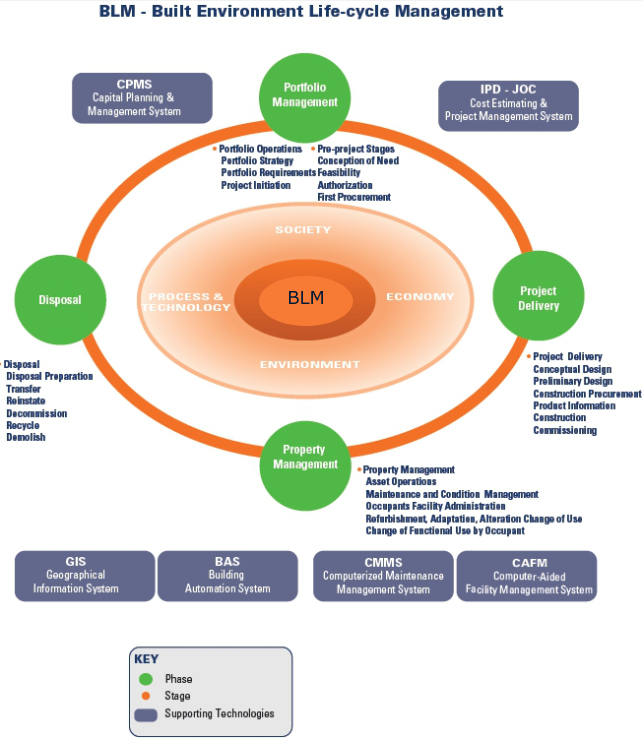 The below diagram outlines the competencies, technologies, and process required for the lifecycle management of the built environment. via http://www.4clicks.com – Premier cost estimating and efficient project delivery technology solutions for JOC, SABER, IDIQ, SATOC, MATOC, MACC, POCA, BOS, BOS… Featuring an exclusively enhanced 400,000+ line item RSMeans Cost database, document/contract/project management, and visual estimating / electronic quantity take-off, QTO. Emergent disruptive technologies and construction delivery methods are altering both the culture and day-to-day practices of the construction, renovation, repair, and sustainability of the built environment. Meanwhile, a shifting economic and environmental landscape dictates significantly improved efficiencies relative to these facility related activities. This is especially important to any organization dependent upon its facilities and infrastructure to support and maintain its core mission. The disruptive digital technologies of building information modeling (BIM) and cloud computing, combined with emergent collaborative construction delivery methods are poised to alter the status quo, ushering in increased levels of collaboration and transparency. A disruptive technology is one that alters the very fabric of a business process or way of life, displacing whatever previously stood in its place. BIM and cloud computing fit the profile of disruptive technologies, individually, and when combined these stand to create a tidal wave of change. It is perhaps helpful to define cloud computing in terms of its benefits. Cloud computing enables far greater levels of collaboration, transparency, and information access previously unavailable by traditional client/server, database, or even prior generation web applications. Multiple users can work on the same data set with anyone, anywhere, anytime, in multicurrency, multilanguage environments. All changes can be tracked to “who did what” within seconds (potentially the best form of security available), and information is never deleted. The disruptive technologies of BIM and cloud computing will accelerate the adoption of emergent construction delivery methods and foster new frameworks. Design-bid-build, the traditional construction delivery method for decades, is inherently flawed. As a lowest bid deployment it immediately sets up adversarial relationships for involved parties. Owners prepare a solicitation for construction projects based on their understanding of them1, with or without third-party A/E assistance, and in most cases they go out in search of the lowest bidder. Then without a thorough understanding of the owner’s facility, bidders base their responses on the owner’s solicitation, plans, and specifications. Owners typically allow a period of time for bidders’ questions and clarifications; but the quality of this interchange is at best questionable if based solely on a written scope, plans and specifications, and/or a meeting with suppliers. Design-build, arguably a step in right direction, falls short of bringing all stakeholders together. More responsibility of design and construction is shifted to the contractor and/or A/E. However, the dual level participation structure doesn’t assure the interests of all parties are equally addressed. Furthermore, the design-build process is typically reserved for major new construction projects versus the numerous sustainability, repair, renovation projects, and minor new construction projects typically encountered by facility managers (fms). Because BIM brings together previously disparate information into a framework that enables decision support, using the technology requires a collaborative construction delivery method. The integration of the domain knowledge and robust processes required to allow fms, A/Es, and other stakeholders to achieve heightened levels of information sharing and collaboration is enabled by methods that include Integrated Project Delivery (IPD) and Job Order Contracting (JOC). Key characteristics of these emergent construction delivery methods include: choices based on best value; some form of pricing transparency; early and ongoing information sharing among project stakeholders; appropriate distribution of risk; and some form of financial incentive to drive performance. Both IPD and JOC allow, if not require, owner cost estimators and project managers to “partner” with contractors, subcontractors, and A/Es to conceptualize, create, cost, prioritize, start, and report upon projects—in the very early phases of construction. IPD, JOC, and Simplified Acquisition of Base Civil Engineering Requirements (SABER)—the U.S. Air Force term for applying JOC practices—are practiced simultaneously by a growing number of organizations and supported by digital technologies. These construction delivery processes are embedded within software to allow for rapid, cost-effective, and consistent deployment as well as the associated level of collaboration and transparency. BIM and cloud computing are disruptive technologies that will accelerate the adoption of emergent construction delivery methods such as IPD and JOC. Construction delivery methods set the tone and level of interaction among project participants and can be viewed as the management process framework. 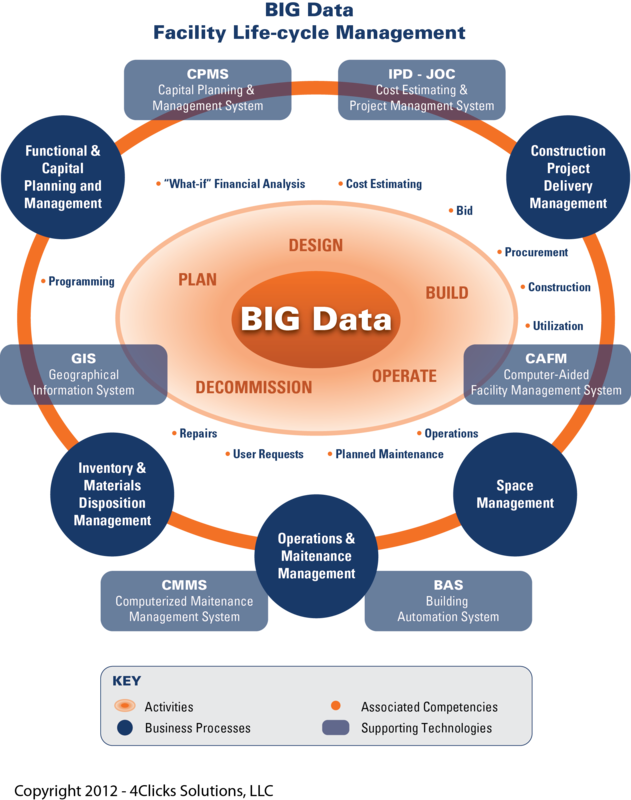 When supported by BIM and cloud computing, the life cycle management of the built environment, and the associated management of big data, can be expected to become commonplace for many construction projects. Cholakis is chief marketing officer for 4Clicks Solutions, LLC, a Colorado Springs, CO provider of cost estimating and project management software. With expertise in facilities life cycle costs and total cost of ownership in various market segments, he is involved in numerous industry associations and committees including the American Society of Safety Engineers, Association for the Advancement of Cost Engineering, Society of American Military Engineers, BIM Library Committee-National Institute for Building Sciences (NIBS), and National Building Information Model Standard Project Committee. 1 “The Art of Thinking Outside the Box;” Vince Duobinis; 2008.